Wow! This heavily optioned Northbank 600C provides the serious offshore fisherman a genuine tough and solid rig. Reminds me of the days when the Allison 195 was built when boats were built to fish, not to look pretty and full of gimmicky accessories. The Northbank 600C is a boat built for the seas experienced in offshore waters. A deep 21-degree hull, high internal freeboard with grab handles in the right places and a no fuss cockpit conducive for fishing. This big girl was wetted in 2015 and is powered by the new generation Mercury 150Hp 150XL EFI four stroke. These motors really take it up to its competitors in the outboard world for their reliability, performance and exceptional fuel economy. The Mercury has been pre-tested via our workshop and is further backed with a limited BIA limited engine warranty for buyers confidence. The motor spins a Vengeance stainless steel propeller and steering is light via the Ultraflex hydraulic steering unit. With approx. 150L of fuel capacity under the floor range is assured for those bigger offshore fishing trips. The engine instrumentation was also upgraded at the time of order and the helm has the Vessel View 4 installed providing the skipper with engines information. The helm is well designed and fitted with the boats switching, a Garmin GPS Map 751 XS colour screen combo GPS/Sounder unit including its mapping card, a GME VHF g-Com radio for communications back to base or boat to boat and for those that like their tunes afloat a Fusion stereo system is fitted. Overhead a quality bimini top provides ample shade from the midday sun and the owner has also had fitted front and side clears for if the weather turns. When towing these can be removed, and the traveling tonneau cover can be clipped on keeping your gear undercover without the risk of it blowing out. The boat comes with a heavy compliment of safety gear as outlined in detail below saving you extra costs and even a MT600G EPIRB is included! For those with a niggly back the Northbank are renowned for their soft ride in choppy waters and who wants to manually pull up a anchor? This boat alleviates that chore as a stainless-steel Stress Free electrically operated drum winch. Simply press the button to deploy or retrieve the anchor! Offshore boats with deep vee hulls can heel over with a beam breeze and you can loose the ride that these deep vee hulls set out to provide, to avoid this, the original owner has also had fitted Lectrotab trim tabs thats allows the skipper to control the lateral heel and keep the hull running true. The rig is trailered on a multiroller Dunbier SRW6.1T tandem axle trailer that marries to the hull like a glove. The trailer was made in April 2015 and has an ATM of 2000Kgs so a reasonable sized 4WD will be needed to tow. Like all our trailers sold they are pretested and sold compliant to ensure your on road towing safety. Be Quick for this Amazing Rig! If you are in the market for a very well respected and offshore suited 20 footer, this heavily optioned Northbank 600C offers the buyer exceptional value, at the now reduced price of $64,995 tow away!!! Procraft 435 SC (2015) Aluminium side console Suzuki DF50A 50Hp EFI 4S 13 hours (2015) Dunbier 4.3S boat trailer (06.2015) Checkout this Procraft 435SC side console fishing package built by Horizon Boats! 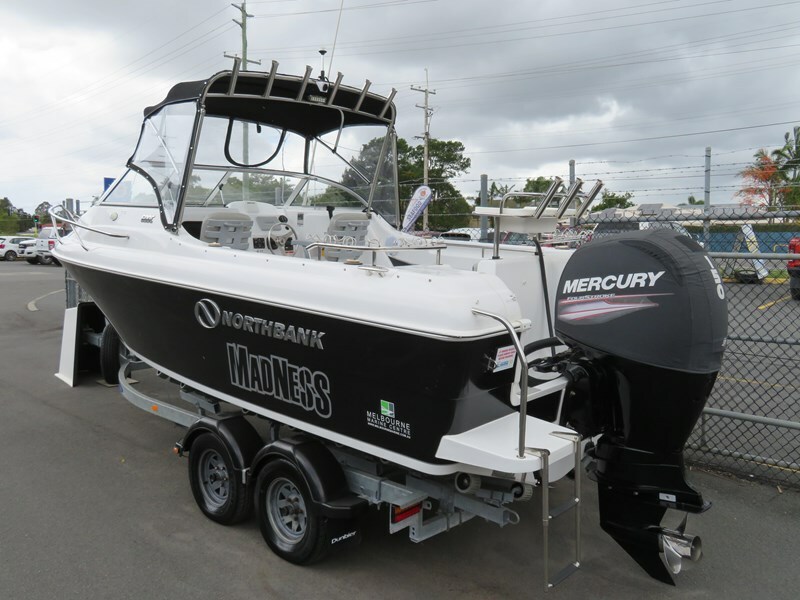 This is your opportunity to scoop up a sensational boating package that presents in as new condition with literally dealer demo hours recorded! Fitted with a swag of accessories for the fisherman and showing just 13 hours, yes 13 hours on the Suzuki SMART DIGITAL flush mounted gauge. This system has all of your engine functions and operations clearly displayed ahead of the helm seat and accessible at your fingertips. First Impressions Off to the side of the console dash is a quality Lowrance Elite 5 Chirp combo fish finder/GPS unit supplied with a map card ready to assist with any of your boating travels and fishing adventures. On the side of the dash panel flush mounted is the latest model GME VHF G-COM two-way radio again adding safety to your boating pleasures. The vast open deck space is perfect for the angler whom enjoys all aspects of fishing with a forward platform designed for tossing a lure or cast net chasing live bait to a crabber setting up his pots chasing a tasty feed. At the transom is another platform providing an additional flat area to traverse while fighting a fish or using your landing net. Ample storage is provided below both platforms keeping the deck space clear and uncluttered for the safety gear that is included as outlined further below in detail. The 2 pedestal seats provided are comfortable for a day out and there are several locations in the floor space to relocate these seats to suit your style of boating and balance of the rig. The plate design of this easily handled Side Console provides additional strength of build while the up to date graphic design along both sides of the hull will make you stand out in the crowd and the envy of your fishing buddies. Overhead a quality bimini top provides some shade form the midday sun and is also fitted with a bimini sock for when lowered and stored. The Motor The rig is powered by a 4 stroke Suzuki EFI 50hp outboard which is the top of the range allowable on this rig you can be guaranteed of exceptional performance with great fuel economy. The price also includes the motors annual engine service circa $470 as an added bonus for the next lucky owner. You will love the clean operation as there are no oil fumes to pollute the environment, so youll be welcome at most of our fresh water impoundments and waterways. Features & Accessories Lowrance Elite 5 Chirp colour combo GPS/Sounder with SD Micro map card GME G.Com VHF radio with aerial Single battery in a battery box Portable fuel tank approx. 24L capacity Stern fuel tank & battery storage shelf Aluminium 3 blade propeller Suzuki smart digital engine gauge 4 Adult life jackets, 2 paddles, v-sheet, mirror, 1 fender Flares exp. 12.2020 Sand anchor with rope & chain, anchor storage shelf Electric bilge pump Bimini top with bimini sock 2 removable pedestal seats (multiple locations) Custom upgrade graphics on both sides of hull Bow, side & transom rails Bow & stern casting platforms Boarding platform Carpeted floor Side pockets 6 rod holders 2 drink holders Galvanised trailer frame, wheels, axle & springs LED trailer lights Tie down strap Youll be GREEN with envy if you miss this one! Priced thousands below replacement value and presents as new condition! What a deal for the next fortunate owner to hook a bargain at $18,995 tow home considering all the additional benefits that come when buying a boat through our experienced and established dealership. Here is an as new 2015 Stabicraft 1600 fisher Carbon, which is only being sold due to lack of use. It is powered by a 2016 70hp Suzuki 4 stroke which has done 22 hours. The boat comes on an Easytow single axle trailer and is fitted with the following options; Rear Boarding Ladder Rod and Canopy Arch Powdercoated Removable Bait Board Garmin Echomap 55DV Garmin 110i VHF radio Single Battery Kit Alloy wheel upgrade Sarca anchor, rope and chain Maxwell electric anchor winch These boats don't come up for sale very often so this is a good opportunity to purchase a quality boat at a very good price. Contact our sales team for information.